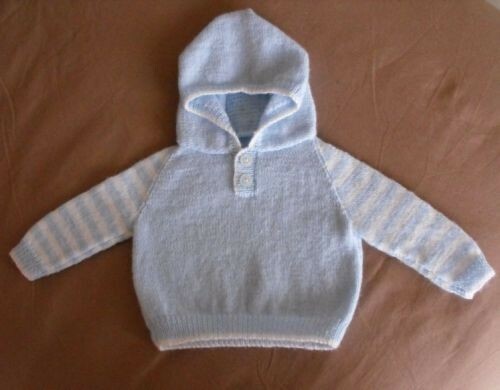 This very easy to knit machine knitted hooded sweater has striped raglan sleeves, and will fit babies from birth to around 12 months. I used Baby Bramwell 4ply for the smaller size in pale blue and white, and Bramwell Fine 4ply for the larger size in navy and red, though any suitable 4ply yarn can be used. 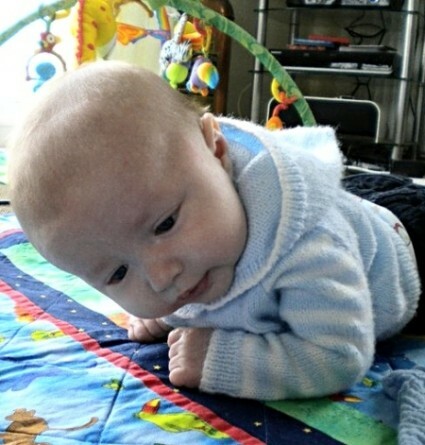 The smaller size is modelled here by my grandson Charlie, who was 11 weeks old and weighed around 12lbs. Suitable for standard gauge knitting machines with a ribber.